To look at Gabriel and Monica Sanchez is to observe a beautiful, loving couple approaching thirteen years of marriage this October. It is clear to all who know them that they are active in church, deeply in love with one another, and devoted to their five children. However, this wonderful and even ideal family portrait was far from achieved overnight. Rather, it has been a step-by-step journey of choices, fueled by the expansive grace of God. When they met at a single-parenting class in 2005, Gabriel and Monica each had a daughter from their previous relationships. After a painful divorce which brought much alienation between Gabriel and his home church, he had no plans to ever marry again. Monica had finally thrown up her hands to heaven in frustration, letting God “off the hook” concerning the task of introducing her to the right man to marry. Instead, she informed God that she would simply focus on being a good mom to her young daughter. Looking back on this time, Monica says, ”Surrender has been a constant in my life. I’ve had to learn how to surrender. Really letting God take control and surrendering my life to him. And it started with just saying, ‘Okay, I’m gonna be a good mom.’ What a concept!” Within a month of this relinquishment, she and Gabriel met one another. Five months after meeting, the two were married. It was less than six months into the marriage when Gabriel discovered something about his new wife that she had managed to keep hidden: his bride was an alcoholic. Monica knew by the age of 23 that alcohol was a serious problem in her life, but like many, assumed that eventually she would be able to take control of the problem on her own. Now here they were, only six months in to a union which held so much promise, considering whether or not their official promises to one another could be upheld. “At that point in our marriage,” Gabriel remembers, “either one of us could have put our hands up and said, ‘This is too hard to deal with. I didn’t sign up for this.’ ” In what would typically be a honeymoon season for most couples, Gabriel and Monica instead found themselves in AA and Alanon classes. The road ahead to recovery was daunting, and Monica asked Gabriel why he decided to stay when so many would (understandably) have left. His response would set the course for many future decisions that the two would make regarding each other and their children. He said that he looked into Monica’s young daughter’s eyes and decided he couldn’t leave because of her. Concern for a little girl who barely knew him revealed the heart of a man who was leaning in close to hear the Holy Spirit’s tender voice. The gravity of these particular circumstances could easily capsize the best of relationships. Instead, thirteen years later, Monica still gushes over Gabriel with such sincerity and affection that those around them long to know the secret of their connection. “I can’t say enough wonderful things about my husband,” she smiles. “He’s amazing. I definitely hit the jackpot.” Clearly he stands ten feet tall in her eyes, and the admiration goes both ways. “I married up as well, so don’t give me all the credit,” he smiles back. This is not the result of lucky chance. It is not the bird of happiness landing on your windowsill. It is not just some miracle that falls together in your lap. Rather, it is waking up every day and making a choice. It is days and days of making decisions, built up over time, slowly becoming a solid foundation— a home. It is choosing to invest in and put others first from Monday to Thursday that leads to “Friday night popcorn and movie time” that you actually anticipate. 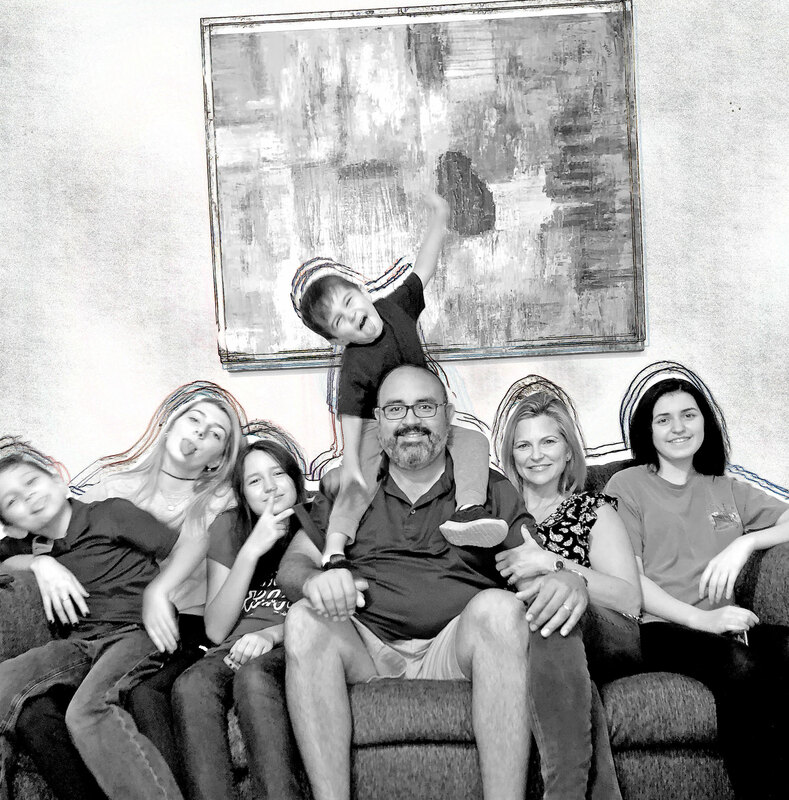 It is how divorce, rejection by the church, addiction, recovery, and sometimes painful family growth can become the beautiful portrait of the Sanchez Crew that we see today. It is when, like a child, we take God by the hand and let Him lead.